I often remember to blog as soon as I'm tucked up in bed, and by that point it just seems too hard to get out of bed again and find my camera! Ugh at myself. I'll do a quick update and then talk about something that is very dear to my heart which will get me back on track for blogging! 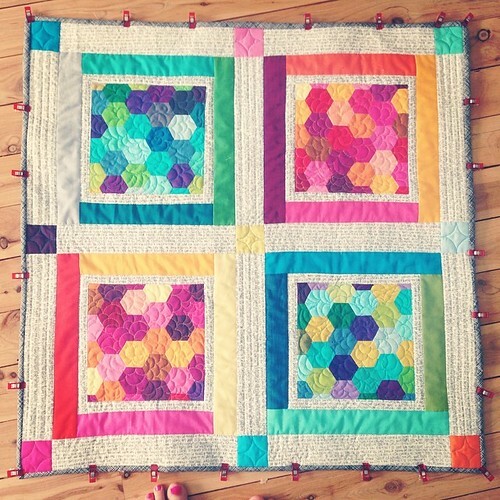 I joined Hive 2 of the Aussie Instabee and this is my test block for my quilt - rainbow brights and low-volume fabrics for the Trellis block. It's a bit fiddly to make but I'm excited about making my 18 and getting 12 more in the post! On the last day of "summer" (aka neverending overwarm hell season) it was chilly enough I felt I could bust out my winter hat. GLORY BE! 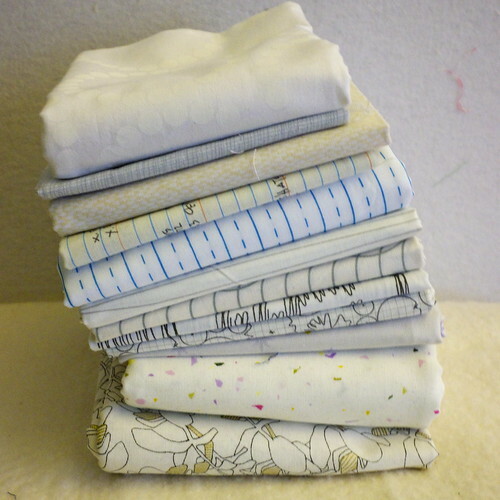 This is the stack for one of my show quilts. I am loving it. It's all Michael Miller Cotton Couture and very simple with only five colors (including white) and the pattern itself just sings. I designed it myself and I can't wait to show it off. But for now, a teaser! 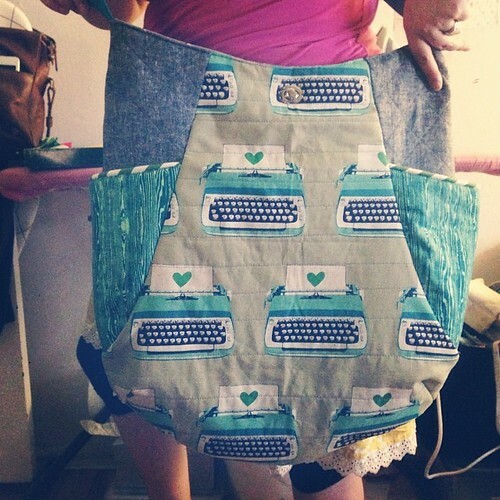 In the midst of having to get these quilts done to submit to show, I procrastinated and made a bag. This is a 241 Tote (the third one I've ever made) and it's upsized by 150%. This bag is ENORMOUS. I might try a 125% scaled 241 Tote next time! I will properly blog about this soon, too. 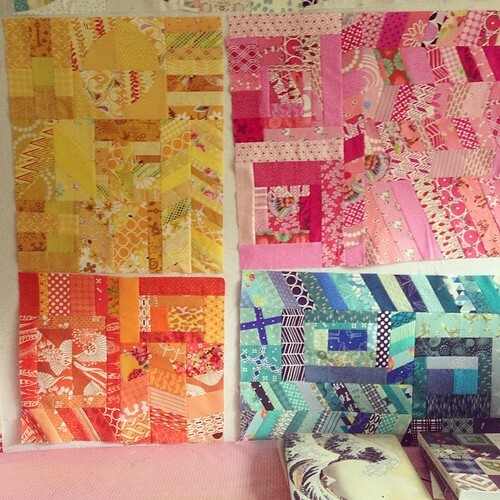 I'm not sure if I mentioned this but a few weekends ago I made an enormous quilt top by accident. 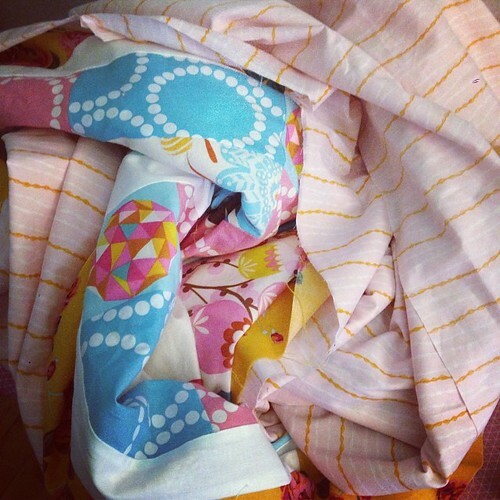 I had the best AMH fabric, and some Pearl Bracelets and some of Tula Pink's meteors (from Birds and Bees) in blue, and they were stacked up waiting to become skirts. 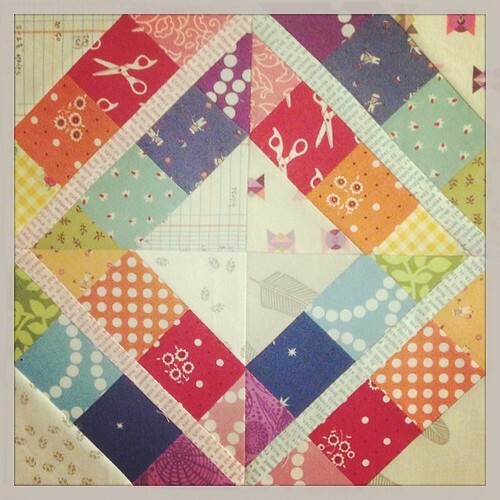 And oh they looked SO good together I made just one block...then another...then ten more...voila, quilt! I used the Hand Drawn Garden gold rose print (Social Climber) as a wide border to frame it, and perfection. Anyway I love it so much I decided it's for me. So I'm backing it with my carefully hoarded Mendocino Kelp Stripe in blush. 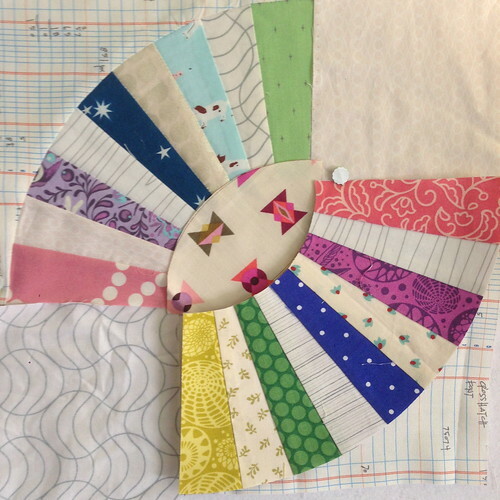 And I picked up my copy of the delectable Quilt Improv by Lucie Summers, gritted my teeth, and began doing something very foreign with my sewing: letting it get a bit crazy. No structure. No plan. Just color, and working in at least half of my color piles. 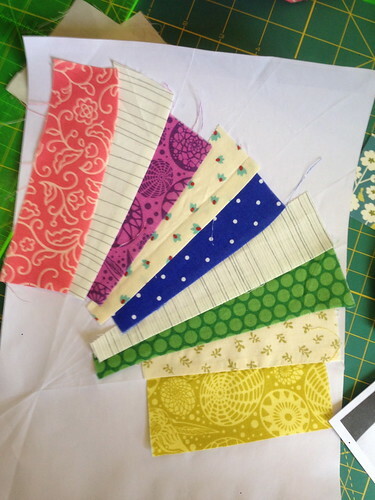 I have three blocks to complete today (purple, green, red) and then I can measure, add the borders, and put it up on the design wall to photograph to submit. Whew. So that's me all caught up! So far in this post I've promised to blog about the Ten Gallon 241 Tote! I must get tidying the house though, and myself...I just rubbed my ear to find it covered in biscuit. That would be my son, whose kisses are often open mouthed and full of food. But he's so lovely I can't help but kiss him back. Oh and just as an aside, we have put Piper into speech therapy and I will probaby talk about that a bit. 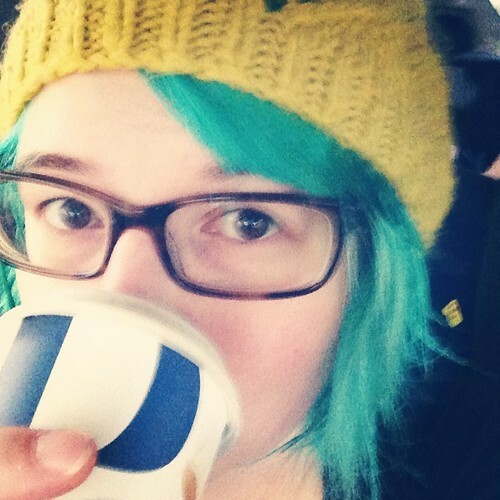 She needs weekly therapy to start but even after one day (and a few tips) I've noticed a positive change. Here's hoping we stay on a good trajectory! 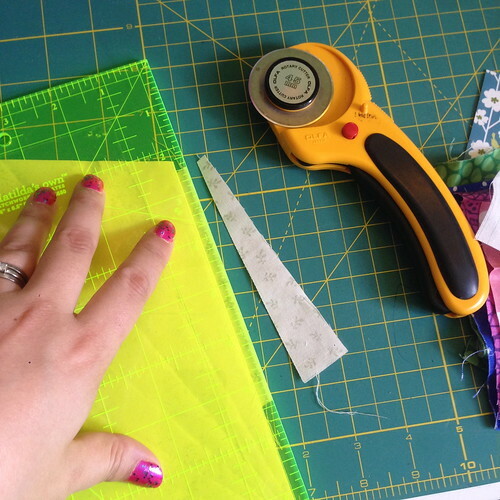 Finally, I am hoping to begin a series on sewing notions and starter skills: what I use, why, where to find it, how it works, and ways to expedite the trickier parts of some techniques. It won't be too fancy, but perfect for beginners - stay tuned! I am hoping to have a weekly update! Hi, you gorgeous people. (Yes, you. You are looking exceptionally nice today.) 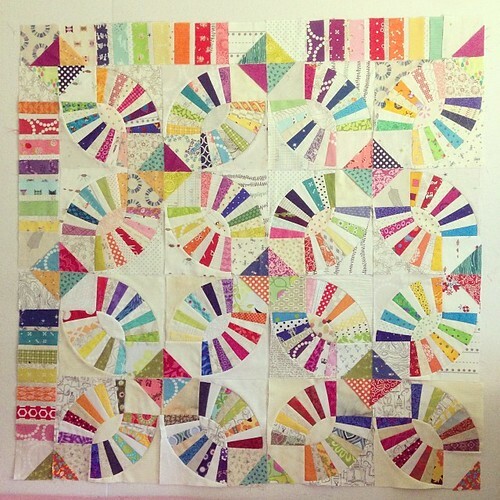 I'm writing up this tutorial super-quickly for the fab folks over at the Sydney Modern Quilt Guild. 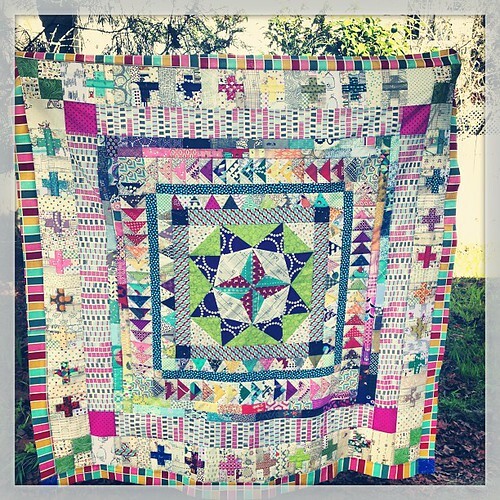 Our group quilt this year is none other than the famous pickle dish pattern! 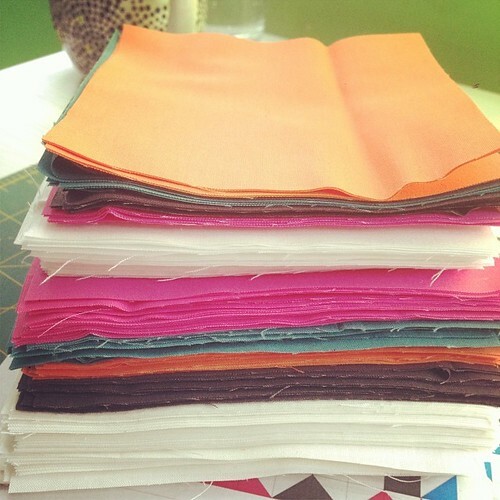 While the Kaffe Fassett book has its own color ideas, of course we do things BRIGHT and BOLD, so here goes. See how those all read white or light? 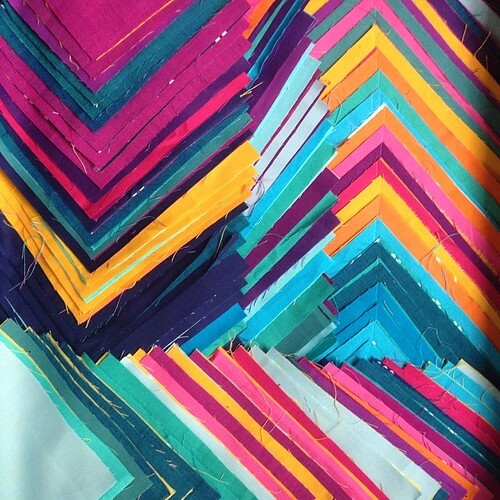 Low-volume fabric works great as a background fabric, especially if you're going for a really scrappy look. 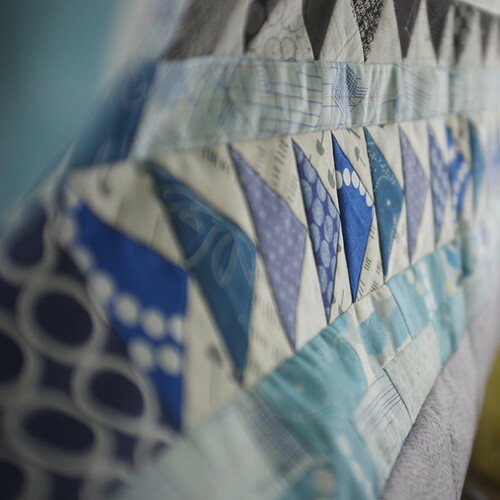 I used low-volume as the background for both my Marcelle Medallion quilts (and probably will for the third one I'm planning) and you can see how scrappy and lovely they look. You can see how these LEAP out at you. HI THERE! BE MY FRIEND! I AM COLOR! Also, note how they read as one color. While the prints vary in scale, design, and may even have touches of other colors, for the most part, they read as a single color. 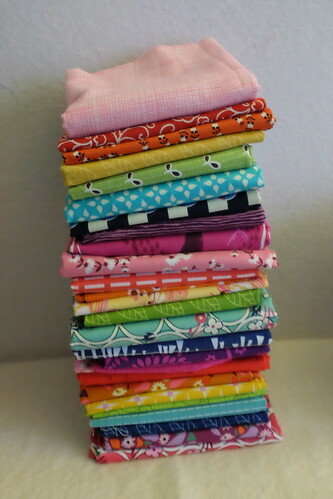 Now, if your fabrics are muddy, muted, or very dark - as is the case with a lot of Civil War Repro fabric - they probably aren't brights. 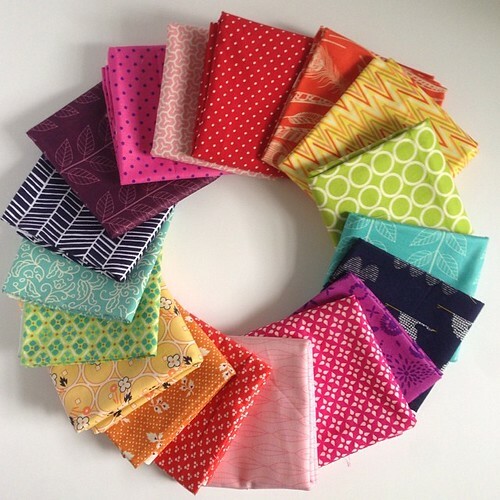 I'm allergic to those colors, so I never stash them, but as with all things quilting, someone else out there can make something really beautiful with fabric I would never look twice at! 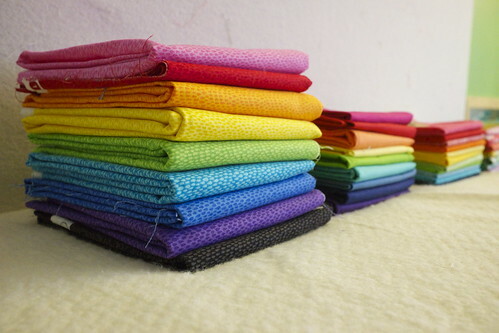 For this tutorial, though, it is essential that we have bright, rainbow-spectrum fabrics that read as one color. 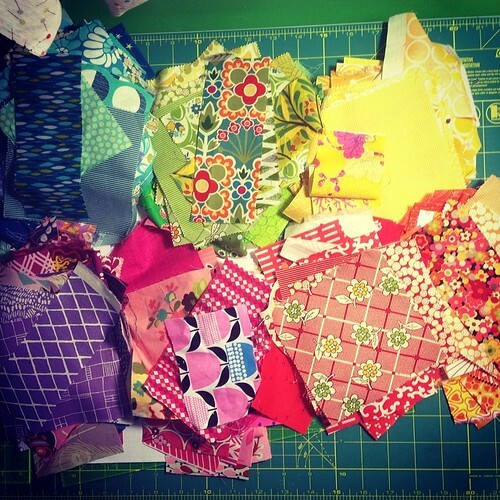 Not sure what color a printed fabric might be? Take a piece of fabric and shake it around in the air. What color is it then? If you still can't tell, it's probably too mixed to use as one particular color, and it qualifies as a 'feature fabric' - something you would build a quilt around. On the the actual tutorial! You will need nine pieces for each paper-pieced fan section. To make a spectrum, simply start at one color and go down the list until you have all five. So if I decide my first fin is GREEN, the next ones will be BLUE, NAVY, PURPLE, MAGENTA. You can start anywhere on the spectrum and if you get to the end simply loop back around to the top of the list. Now, look. I'm not going to go into a great deal of depth teaching you how to foundation piece, because a) small children, and b) literally hundreds of other people have done it so much better. (See here, here, and here.) So if this is too basic, please shoot me an email or leave a comment and I'll try and address your questions as best as I can! Suffice to say, this is the easy kind of foundation piecing, as it only builds one line at a time! 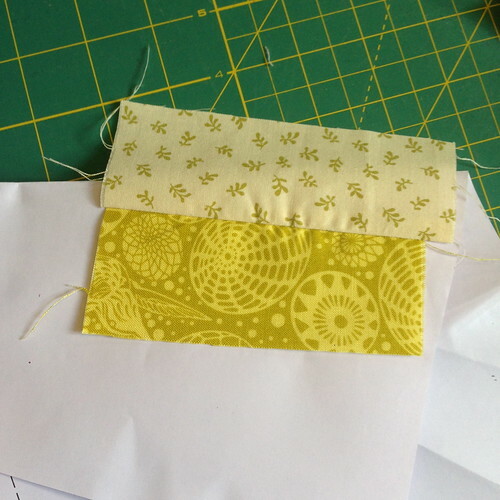 Put piece one (in this image, my yellow strip) and your low-volume separator piece RIGHT SIDES TOGETHER. 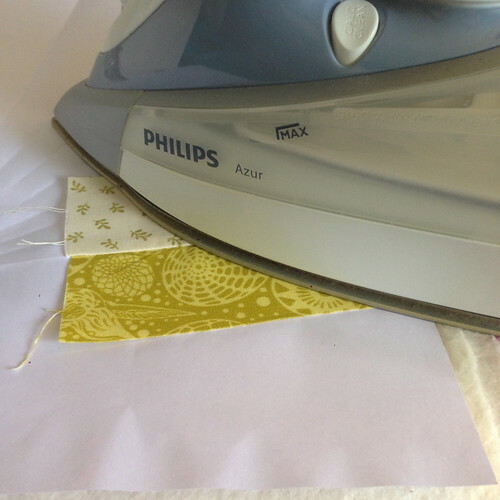 Hold your paper up against a window or light source, and, turning your paper so that the blank back of the page faces you, place the fabric, COLOR PRINT DOWN, on the back of the paper. 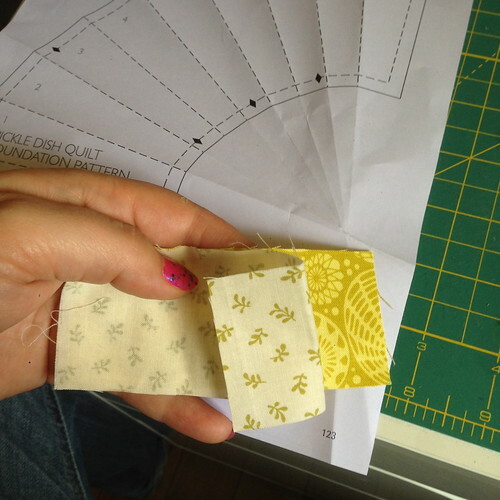 The line between steps 1 ans 2 should be covered by both pieces of fabric by 1/4". You should be looking at the wrong side of the low-volume piece. 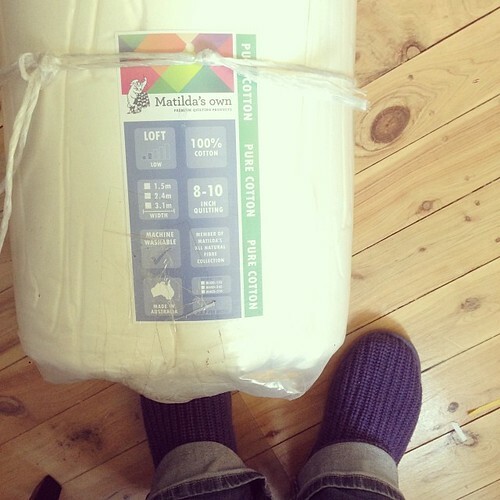 Once you've sewn the seam, open it up, and press it. 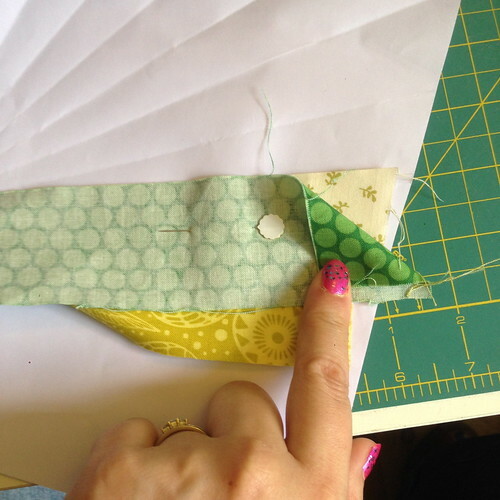 Now the line between the second and third fins should have a fold: find this fold, and fold the paper back beneath the stitch line so the fabric hangs out of the edge of the seam line. See it? 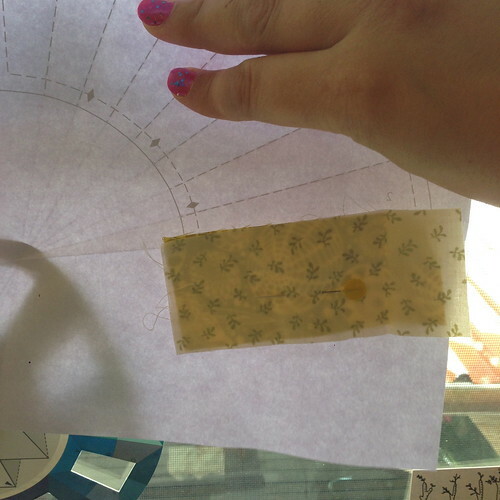 Take your ruler and measure 1/4" from the edge of the PAPER. Trim the excess fabric off. Now you can unfold the paper and move on to the next step. Now you will get your next COLOR piece. Set it, right sides together, on top of the low-volume middle piece, and pin. 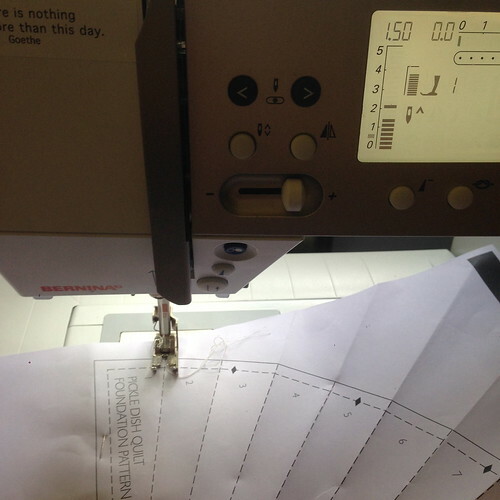 Sew it on the printed side of the paper, then repeat the pressing, folding, trimming steps, alternating rows of your spectrum and low-volume prints! Now it's time to trim up the block! 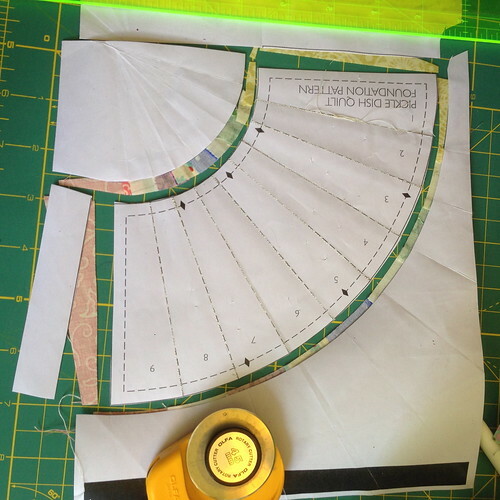 I just CAREFULLY freehand around with my rotary cutter on those curves, but I use a ruler on the straight edges and go zip zip! TA-DA. You've made a fan! Next tutorial we'll talk about plastic templates for those curved corners and center eyes, but for now, here's a very "design wall" idea of what each block should look like! You can see how the brights really pop in that bottom one. In the top, I used too light a blue, and it's been bugging me, so I'll probably re-do it. 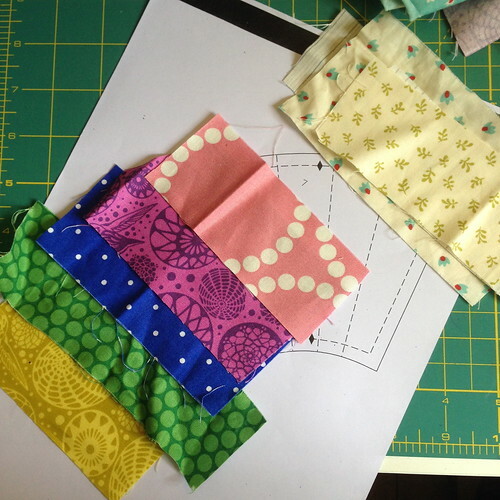 I just make photocopies of the existing pattern piece before I start any paper piecing - it's insurance against mistakes and you can always make a cushion out of the "not quite right" pieces! Let me know how you find the tutorial and if you have any questions shoot me an email or leave a note in the comments! Copyright © 2010-2013, Penny Poppleton. All rights reserved.